Richard Kirk Mills was born in NYC and raised in NY and Long Island. He currently divides his time between studios in New Jersey and the Catskills. “Rick” focused on painting and art history as an undergrad and grad student at City College of New York. It was in High School in NYC that the art chairman and painter Sol Zaretsky inspired Mills’ early direction as an artist. Decades later they often exchange studio visits. Driving a cab in NYC during the 70s and 80s he drew the quiet side of the city, culminating in paintings and many print editions co-published with Orion Editions. He became a master printer, taught at the Pratt Graphics Center and helped found and lead the Manhattan Graphics Center. Frequent trips to Maine led to a poetry print collaboration with poet Fred Lowe. 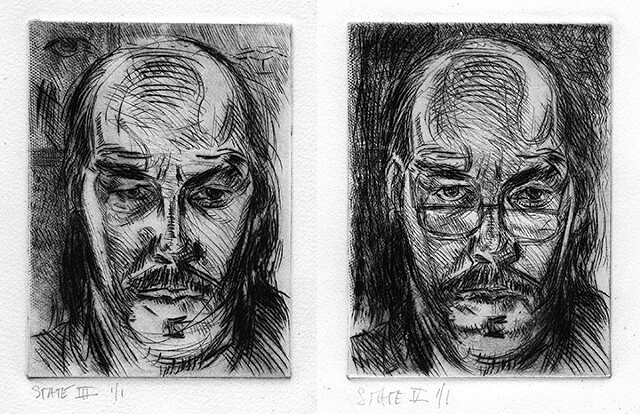 Mills was professor of art at LIU Post where he directed the printmaking program for 28 years. After years of representing landscapes, in 1996 during an NJ Meadowlands eco boat tour by Hackensack Riverkeeper Bill Sheehan he was inspired to merge his own environmental activism with his art. He began research on environmental, topographic and cultural place histories. He expanded his printmaking skills into the digital realm with layered, collaged narratives with text. These were sited outdoors in damaged and recovering public places along rivers and in wetlands. Mills assembled digital archives: historic maps and atlases, aerial and satellite images, photos, postcards, oral histories, newspaper articles, essays on local biota, transportation history, early settlement patterns, land use deals, fisheries reports, census records, anything he could find to reveal the drama of unplanned growth’s effects on the local environment. He honed his skills as a presenter before regulatory agencies as part of an aesthetic arsenal. From 1996 to 2010 years Mills led and collaborated with artists, scientists, historians, and educators in some of New Jersey’s most damaged landscapes on diverse ecoart and public art projects including design of community gardens, rehabilitation of wetlands, interpretation and narration of local landscapes – their environmental and cultural history. He has received grants from numerous arts foundations and State and Federal agencies including the NJ State Council on the Arts, Puffin Foundation, Geraldine R. Dodge Foundation, USEPA, NJDEP and NJ TRANSIT. Along with Riverkeeper he credits as inspiration and support a long list of eco feminist writers and artists from Lucy Lippard (“Lure of the Local”), Suzanne Lacy (Mapping the Terrain”), Aviva Rahmani (“Trigger Point Theory”), Amy Lipton (Ecovention”), Mierle Ukeles, Lynne Hull, Betsy Damon and countless other courageous pioneers. Mills has been artist in residence at the Teaneck Creek Conservancy and a visiting Fellow at the Jentel Foundation, Ucross Foundation and the Virginia Center for Creative Arts. He has exhibited in New York and internationally. Today Mills’ primary focus is on painting. The obvious subjects include the familiar landscapes, gardens, structures and interiors that surround him. He continues to be inspired by a generation of painterly realists as he seeks to extend the possibilities they explored. This can only lead to an even more personal poetic and painterly touch in response to what he sees and feels. His years of ecoart work add another layer of feeling for our landscapes and sense of place and perhaps of loss.